Freiburg, Essen June 27th, 2016. 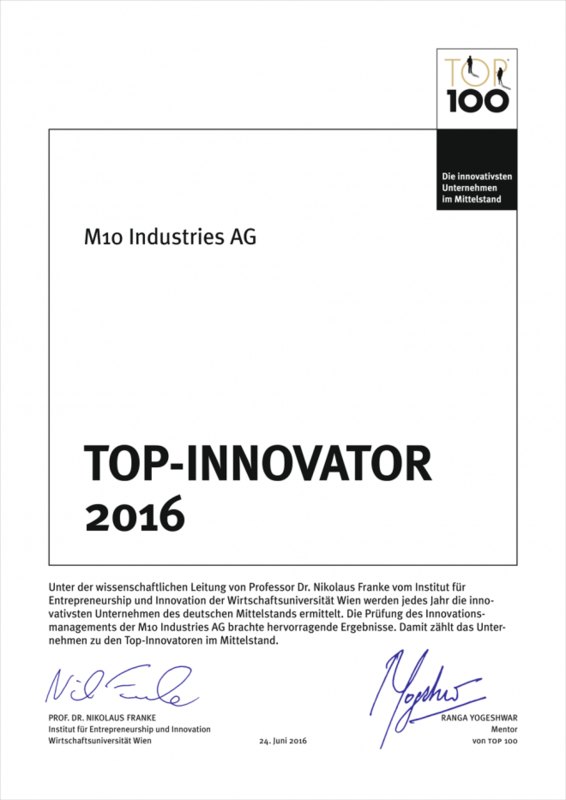 Freiburg-based mechanical engineering company M10 Industries AG has been awarded the TOP 100 Seal of Approval as a top innovator amongst German SMEs. The innovation competition’s mentor, Ranga Yogeshwar, honored the company last Friday, June 24th, as part of the German SME Summit in Essen. M10 Industries develops, assembles and installs high-performance soldering machines for the photovoltaic industry: “Within the mechanical engineering sector we are up against strong competition — the Top Innovator award confirms us in our continued mission to provide the best solutions for our customers”, Gregor Reddemann, Managing Director at M10 Industries, explained at the award ceremony. TOP 100 has been on the market for more than 20 years and is considered the most important award for innovative SMEs. M10 Industries has developed a new high-performance stringer called “Kubus”, the world’s only stringer able to provide an uninterrupted production process. The machine can solder up to 5,000 solar cells per hour as the machine produces six strings at once. “The advantage is evident: it allows a more cost-effective solar module production process”, Reddemann explains. This innovative machine made by the SME from Freiburg, Germany, is constantly being further developed by a small and vigorous team. For Reddemann the TOP 100 Seal of Approval is also “an award for the team effort.”The innovative success of the start-up company has not only convinced the scientific TOP 100 team: only last week, M10 Industries’ high-performance stringer “Kubus” was presented the Intersolar Award 2016 for innovation at the Intersolar Europe trade fair in Munich. Always being ahead of the times is everyday life at the Freiburg company. M10 Industries was established in 2011 by Gregor Reddemann, Günter Schneidereit and Reinhard Willi with the idea of designing a soldering machine (“stringer”), for the first time ever, would enable uninterrupted production of photovoltaic modules.”That is an absolute innovation, no other machine on the market has these properties,” Willi and Schneidereit underline. They are the main shareholders and bring their experience to the group of companies as two of the solar energy pioneers. The group of companies can thus also look back on twenty years of experience in mechanical engineering in the photovoltaic industry. Over 4,000 companies showed their interest in participating in this year’s TOP 100. 238 of the 366 applications in the qualification round made the TOP 100 (at maximum 100 in each of the three size categories). Companies were assessed by Prof. Dr. Nikolaus Franke and his team from the Entrepreneurship and Innovation Institute at the Vienna University of Economics and Business.